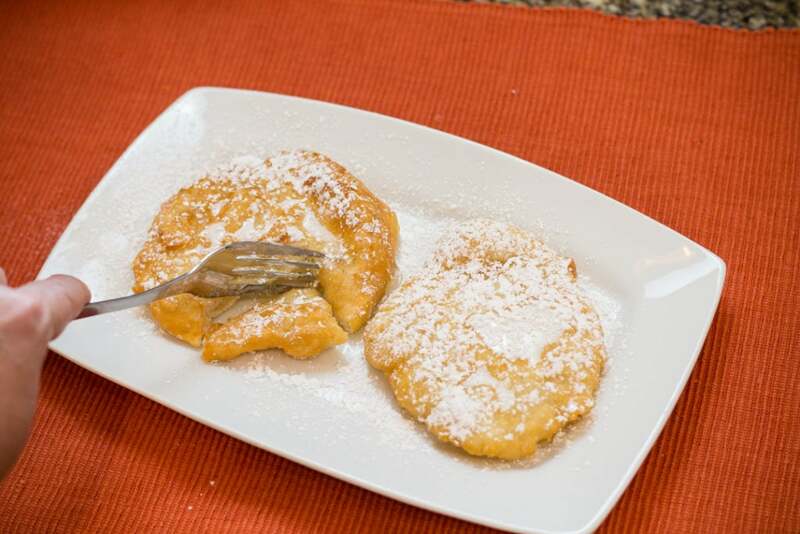 Yummy Indian Fry Bread, served as a sweet dessert or even better with Navajo Tacos. Making this delicious fried bread recipe is quick and easy either in the Instant Pot or on the Stove. Growing up I was served scones on occasion as a treat with powdered sugar and oh how I loved them. Never knowing how amazing this delicious fried bread could be with savory toppings, I only knew the sweet taste of these scones. Of course as I got older and being offered a Navajo Taco my eyes were opened to the possibilities! haha… As much as I love Indian Fry Bread as a sweet treat, I also love when paired with mouth watering beef in a taco sauce piled high with my favorite toppings. 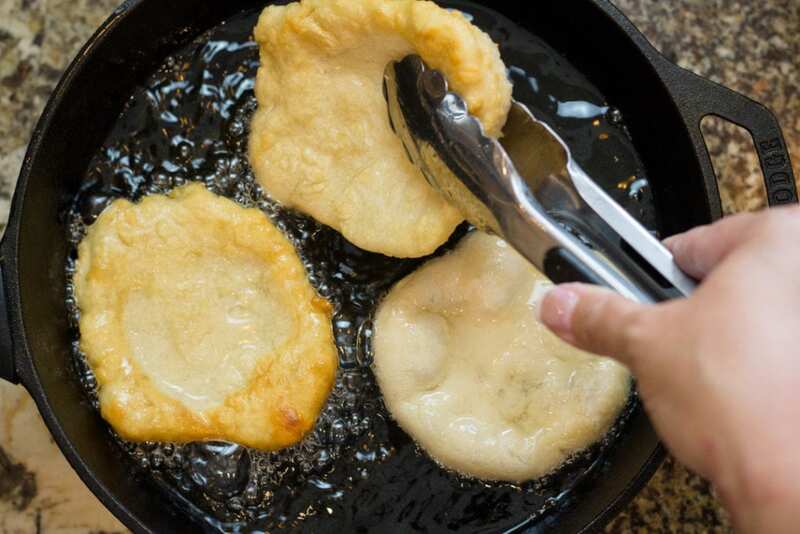 How do you prefer your Indian Fry bread? I’d love to hear! Directions for both the Instant Pot and Stove are included in the recipe card below and are both easy to follow and make. Instant Pot: Heat enough oil to fill bottom of Instant Pot about 1 in. Set Instant Pot to Saute’ and allow oil to get hot. Instant Pot will read “hot” when it’s ready. 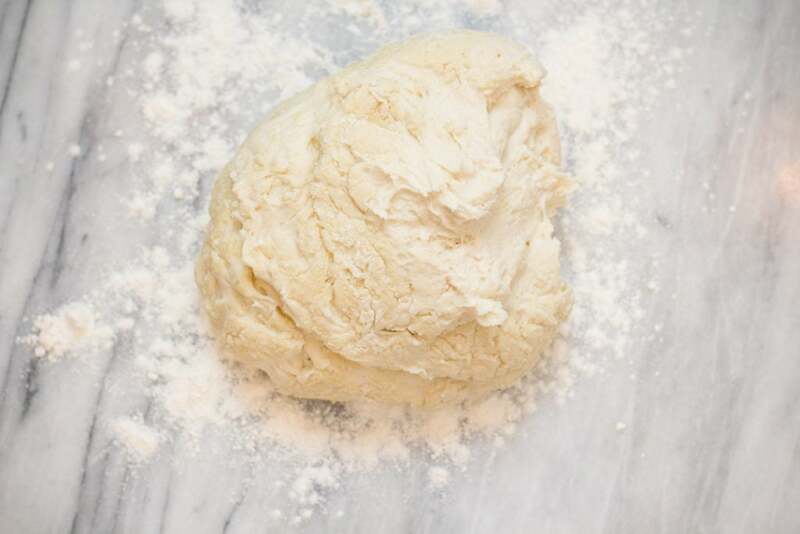 Using the palms of your hands press the dough and using your fingertips stretch the dough to form a circle about 3-4 inches in diameter. Then carefully place in hot oil and allow to fry. When it’s golden brown on the bottom, flip dough using tongs. Remember oil will be HOT and can burn if it touches the skin. Remove from oil using tongs and place on paper towels to drain. Serve Hot. 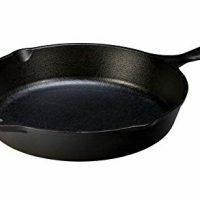 Stove Top: Using a Frying Pan or Cast Iron Skillet fill bottom of pan with oil to fill about 1 inch and allow to get hot over Medium/High heat. 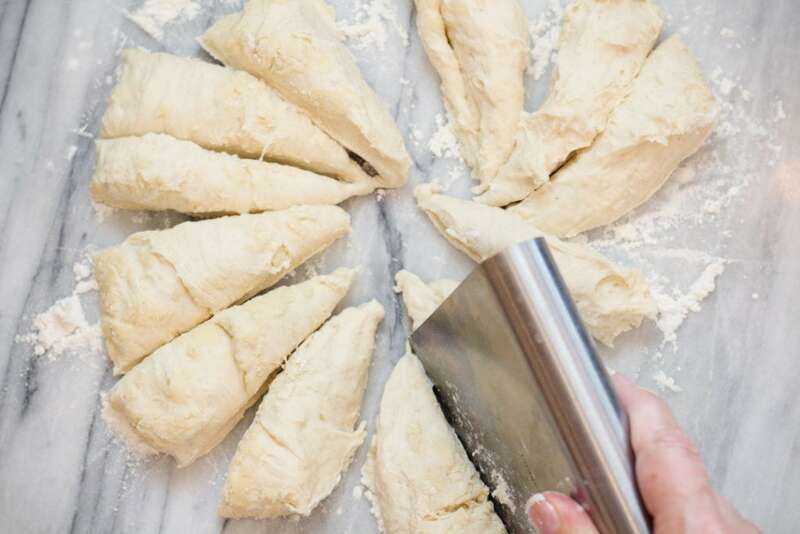 To test, drop a small piece of dough into hot oil. It should bubble. If not allow to heat longer. 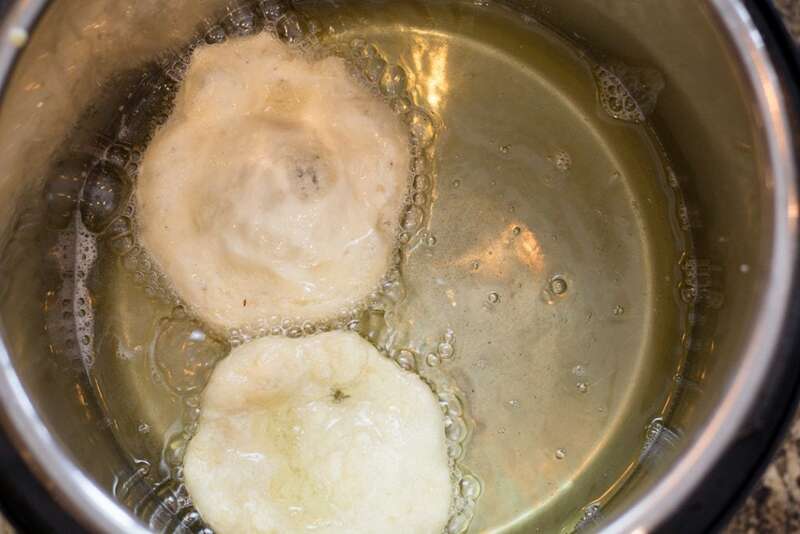 Place rounded flattened dough into hot oil and allow to fry on one side until golden brown. Flip using tongs and fry other side to golden brown. Remove from oil to paper towels to drain. 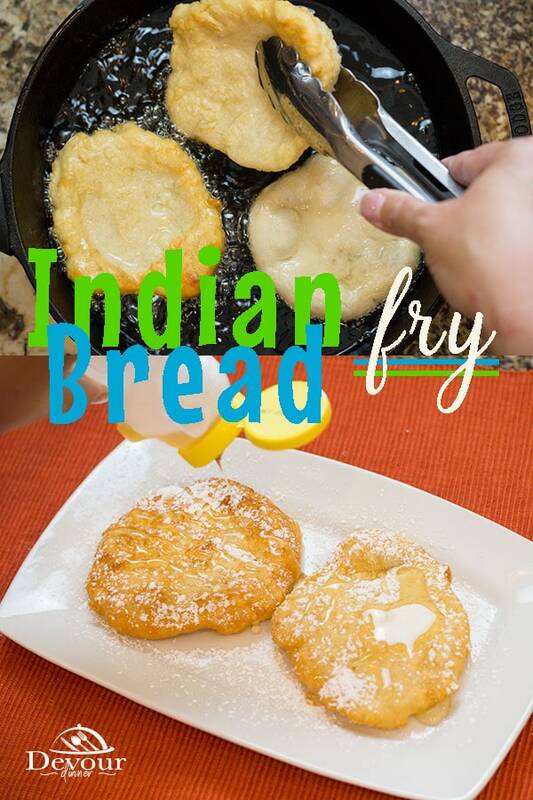 What is Indian Fry Bread? 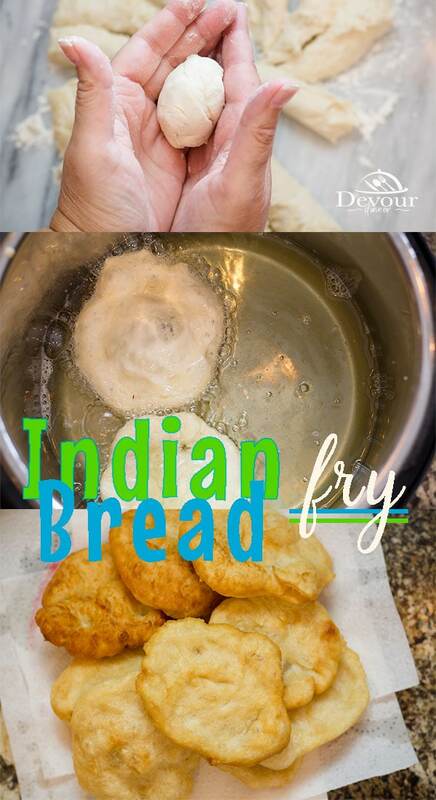 Indian Fry bread is a flat dough bread that is deep fried in oil. This simple ingredient recipe is eaten alone or with a variety of toppings from sweet to savory. Trust me, serving Indian Fry Bread is the least of your worries. 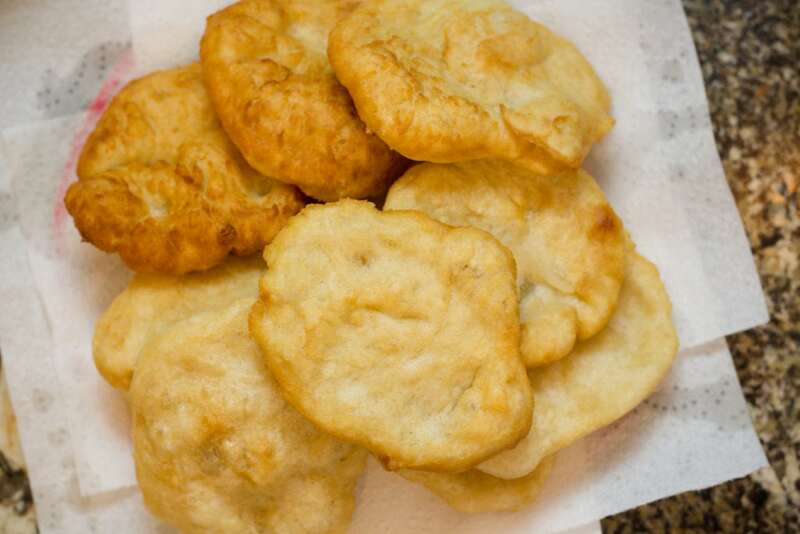 Having enough Indian Fry Bread on the other hand is always a challenge. It’s just so good. Served with Powder Sugar and Honey is a perfect snack or treat. And of course with savory toppings like tender beef in taco seasonings loaded with lettuce, tomato, salsa, sour cream, cheese and avocado is an amazing meal. 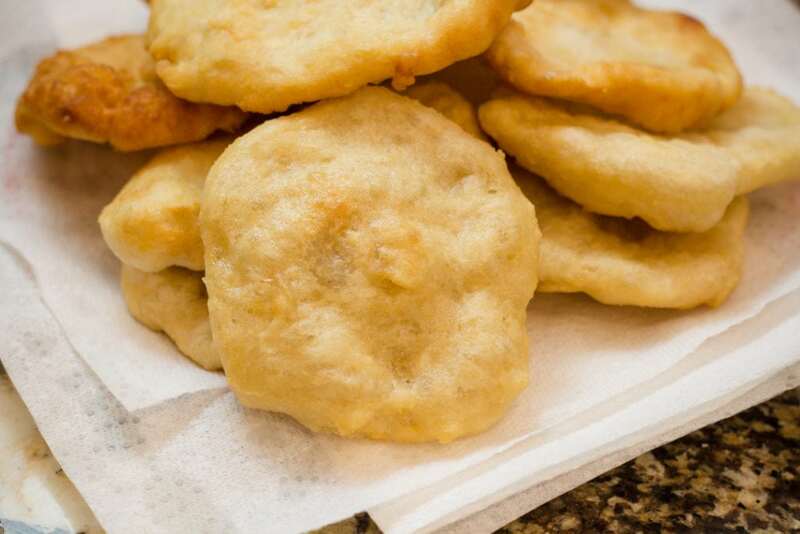 Indian Fry Bread is easy to reheat. Wrap bread in foil and place in oven at 350 degrees for 10-15 minutes or until dough is hot to the touch. 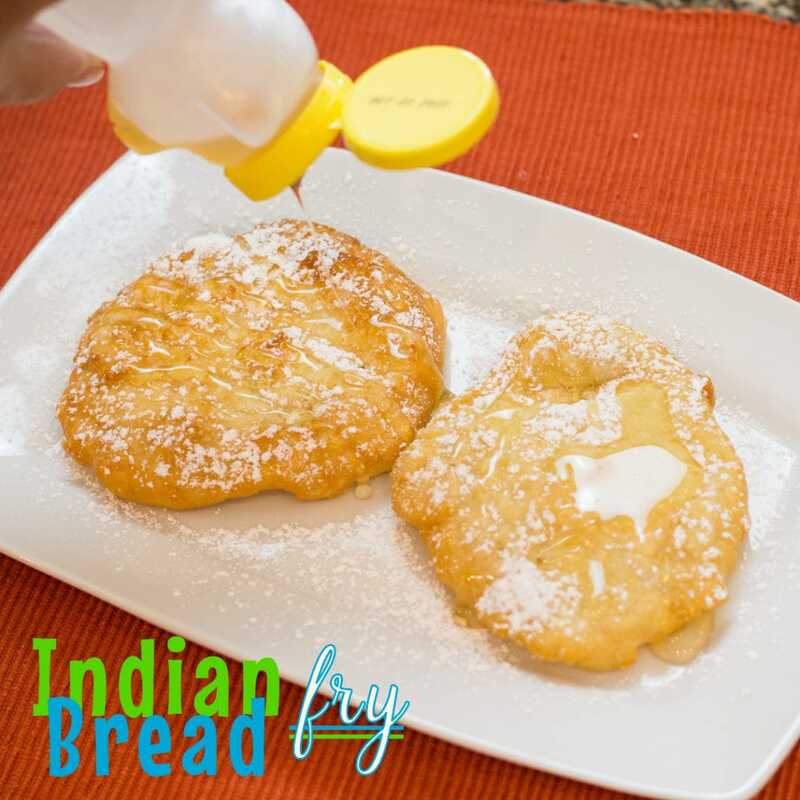 Indian Fry bread can be served plain, with sweet toppings like Powdered Sugar and honey, or with savory toppings like meat and cheese. 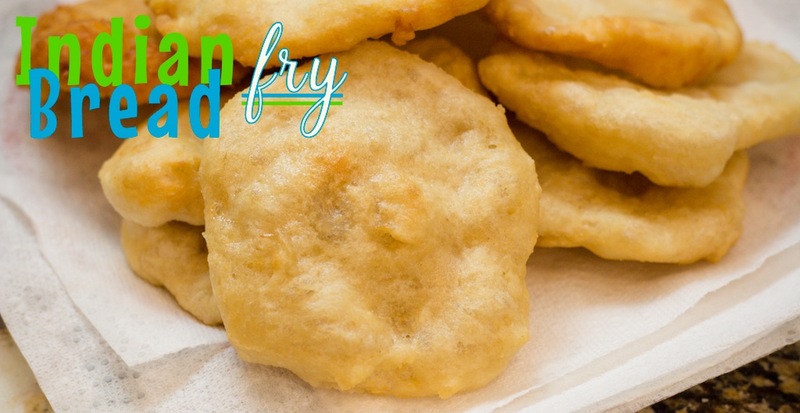 The delicate crispy outside of the fry bread with the soft and chewy inside is completely addicting! 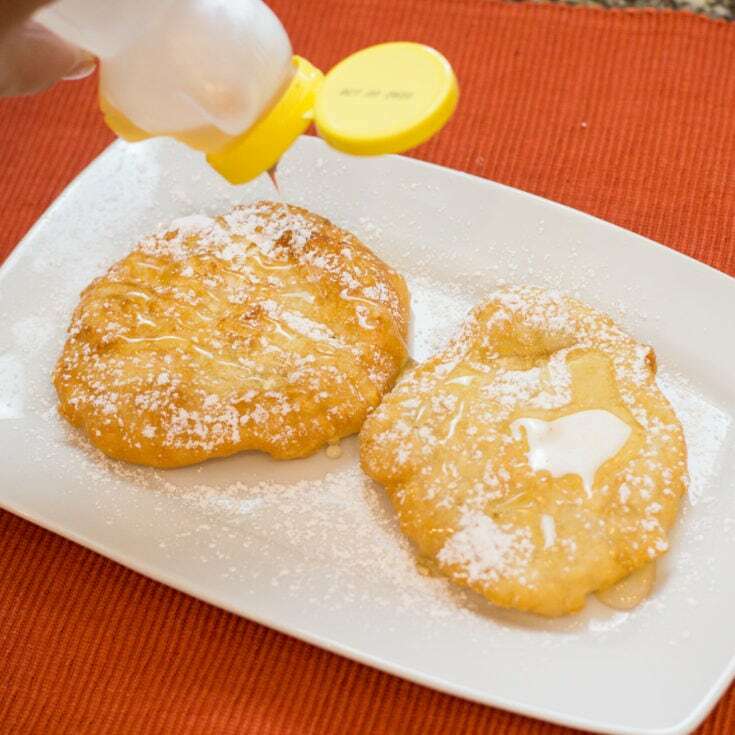 Just think… Fry Bread tossed in Cinnamon and Sugar and piled with Vanilla Ice Cream and drizzled in caramel and chocolate. Oh yum! Now that’s a dessert I can’t wait to have. Want more Delicious Savory Recipes like this one? Of course you do. Check these out! Like this Recipe? Make sure to PIN for later! Have a Sweet Tooth? Try these Sweet Recipes!